Taking a break from the gastronomic documentary, for your information, we just bought a mattress. “So what’s the big deal”, I can hear you ask. Well, up until we bought this, we have been one mattress short! Haha! Some days when we have visitors, we have to plan the musical chairs of mattresses… except this is more like musical mattresses. Haha! 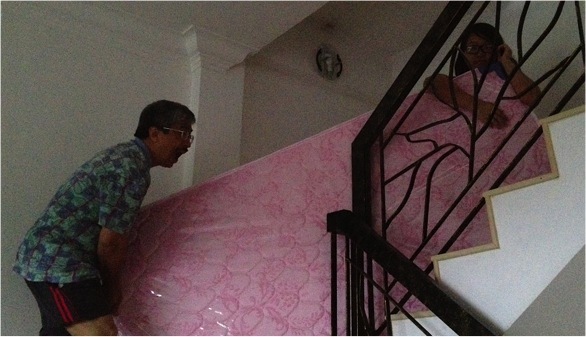 We have always bought mattresses that are firm and hygienic. Over the years we found that we trusted mattress latex ones as the material that could give us a good night’s rest – it does not deteriorate quickly and it supports our backs very well. So after the hefting and heaving of the mattress up the stairs by ourselves, Hubby and Arrow #3 enjoyed a quick rest on it before being on their way again Haha! This entry was posted on 10/05/2013 at 22:42 and is filed under Advice, Health, House, Household. You can follow any responses to this entry through the RSS 2.0 feed. You can leave a response, or trackback from your own site.